I had the fortunate opportunity to attend two great events in New York and Washington, D.C. last week. Interestingly enough, they were both centered around women in the alcohol industry. Something stood out to me at the annual Florida convention for the Wine & Spirits Wholesalers of America (WSWA) this past year—there was not a lot of women at the executive level at distribution companies. Most of the women I came across were on the Maker side and they were pouring tastings and providing info at the booths. The alcohol industry, historically, has been predominantly male, especially on the distributor side. Back when I was running sales on the Maker side of things, I would present our wines at distributor sales meetings across the country. Friday mornings usually, all the sales people gather to meet and have tastings/presentations from the wineries in their portfolio. (On a side note I always tried to be first or second presenting; after four or five presentations about “amazing wines from California,” sales reps’ eyes start to glaze over.) However, glazed eyes or not, the room of sales people and executives was predominantly men. At least 80% or more. Well, times are a changing and the two events I went to last week proved just that. Excellent content aside, the networking with female executives in all three tiers was amazing. Such smart and motivated women out there. I left invigorated and excited for the future of the booze biz. The Women of the Vine Executive Summit took place at City Winery in New York on Wednesday. This organization was founded by Deborah Brenner several years ago and has been successful in pulling together women from the industry to network, learn and support each other. The WSWA’s Womens Leadership Conference was in D.C. on Thursday and Friday of last week. It was a group of about 80 women executives exclusively from the wholesale tier. Both were great events. Mentor Programs: There was a lot of talk at Women of the Vine about how to build a successful mentorship program for women. Some very large companies have committed to connecting men/women mentors with women mentees. Monthly calls, quarterly meetings, budget needed etc. were all discussed. LibDib is currently at 15 employees, and 7 of us are women. So, I don’t think this program is needed here at this time. But I love seeing the steps large companies are taking to diversify their employee base. Companies with Female Board Members make more money: This was mentioned as proven via data at both conferences. It got me thinking about my next board appointee. “Everything can be traced to a plot of land and a farmer.” This was said by Heather Greene in a Whiskey tasting at the Women’s Leadership Council Conference. Not really women in the biz related, but it totally resonated with me and our business model here at LibDib. We are all about the stories, the people and the places involved with the products on our platform. Be Flexible: When it comes to encouraging more women to be in the workforce at traditionally male dominated companies, flexibility is key. Women often wear many hats: successful employee, as well as wife, mother, caregiver, etc. Be considerate of that when scheduling meetings, especially before 9am and after 4pm. Most employees are connected to work 24-7 with their cell phones these days anyways. Being flexible and considerate with office time will pay off in dedication to the company and to the overall corporate culture. Take Risks. Lee Dunn, the head of White House Outreach at Google spoke on Friday. And when asked about her advice for women advancing their careers, she said one thing: take risks. I couldn’t agree more. When I left my long-time job at Clos LaChance to start LibDib, I took the biggest risk of my life. When I first launched, I didn’t sleep for months…constantly doubting my idea about a new way to think about 3-tier distribution. 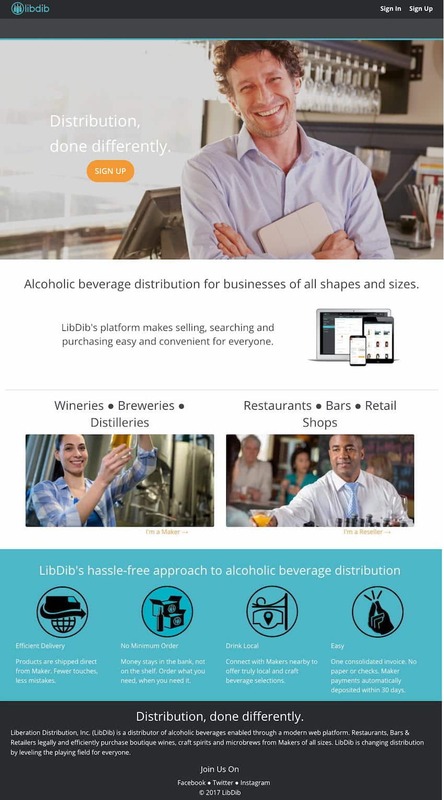 Now LibDib is nearly 1,000 products strong with hundreds of buyers signed up and orders coming every day. I know this risk will be worth it. Overall, things really are changing for women in this predominantly male-dominated industry and I couldn’t be happier or more inspired by it.